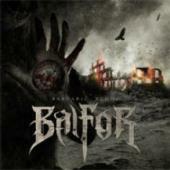 Ukranian band BALFOR has been at it for thirteen years, and according to the info they are aimed at fans of DRAGONLORD, DIMMU BORGIR et al. One diffuse mystical intro later surprisingly meek drumming ensues. The vocals are muffled but not appalling. They have unexpectedly cozy grooves; and a certain penchant for storytelling, but they are not up there with the best in the genre. What I miss is mostly theatrically arranged and orchestrated parts. That is needed if you are a stereotype black metal band with monotone drum patterns. The guitar work and the vocals are nice, but they need an augmentation to improve the tracks. In spite of these lacks they do very good in tracks like “Pure Barbaric” and “Light´s Demise”, plus the outstanding effort “The Perfect Fire”. But the opening is noticeably weak and the songs are of a very varied quality. I believe that the fans of the major bands in the genre will opt for other albums.